Get notified when Tennessee Titans tickets are available! The Tennessee Titans are an American professional football team headquartered in Nashville, Tennessee. 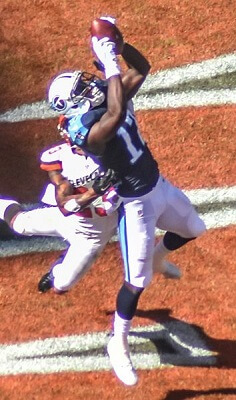 The Tennessee Titans are a part of the National Football League. Once known as the Houston Oilers, they began to play in 1960 in Houston, Texas, as part of the American Football League. Before changing their name to Titans in 1999, the Oilers won the first two AFL championships. This team plays at the Nissan Stadium in Nashville, Tennessee, which has a capacity of 69,143. Their colors are navy, Titans blue, red and silver. See them play live by using the links above for Tennessee Titans tickets and game dates.